Trifecta offers linen products designed to meet the needs of medical and home-care facilities. Our top-quality linens are tightly woven to withstand the rigors of daily use. Trifecta linens adds a touch of class to any hotel room. From bath towels to bed sheets, our top-quality linens will keep your guests feeling relaxed and comfortable. 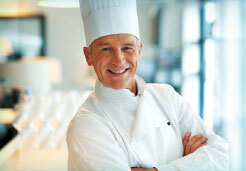 Trifecta offers quality-woven linens for the restaurant industry. From tablecloths to aprons, our colorful linens add style and sophistication to any restaurant or dining room. Trifecta Linens is a privately owned and operated company established in 2012 with the purpose of bringing the best combination of cost, quality, and durability to medical, hotel and restaurant linen customers. Trifecta's suppliers have extensive experience in these industries and deliver the optimum combination of first rate quality, affordability and durability. When working in a medical facility, hospital, or simply taking care of a patient at home, you know how important their comfort is toward their well being. For this very reason, Trifecta Medical Supply prides itself on being a supplier of medical. Hotel guests always look for comfort, quality and value. We challenge ourselves to consistently provide the best quality and service possible.